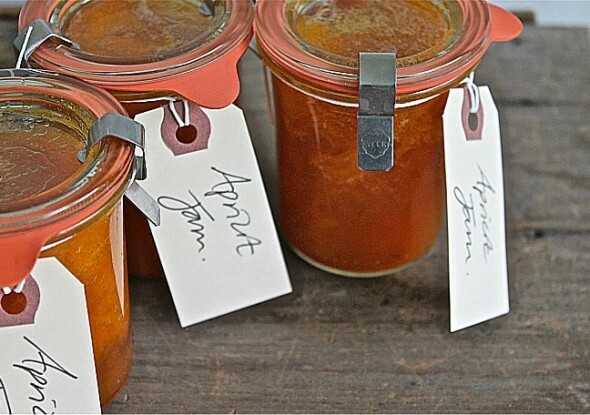 Small batch, ruby apricot jam in glass Weck jars. Phenomenal alone or pressed into a grilled cheese sandwich. Or slathered on cornbread and topped with fresh whipped cream for dessert. I keep the skins on for color and flavor and also like this jam quite chunky. If you want a very smooth jam, you should dip the fruit in boiling water for 20 seconds and then hold it in cold water to slip off the skins and then cut into small pieces. If you don't have a vanilla bean, no worries - just use some extract. Same for the cinnamon stick. Cut the apricots and remove pits and place in heavy-bottomed pot, reserving a few pits. Add sugar and water and heat to the boil, mashing the fruit as you go (not perfectly - chunky is fine). Add bean and stick and 3 pits (for flavor). Let simmer for about 15 minutes, stirring a little. Remove bean and slice along the middle. Scrape seeds and add to jam. Add the lemon juice. Bring to the boil for 5 minutes, stirring so it doesn't burn. Remove pits. Remove from heat and put in clean glass jar. This will keep in the fridge for a few weeks. Enjoy on toast or in yogurt or baked onto chicken or cornbread.